111 West 57th Street is a new tower designed by SHoP Architects that is poised to be the world’s most slender skyscraper. Image courtesy of SHoP Architects. The base of the tower will be constructed in a courtyard surrounded by the existing Steinway building. Image courtesy of SHoP Architects. The northern facade of the tower is created from glass that highlights the beautiful panoramic views of the Central Park from the tower. Image courtesy of SHoP Architects. The 1,438ft tower will be built on a base that is merely 60ft-wide. Image courtesy of SHoP Architects. A residential tower designed by SHoP Architects, 111 West 57th Street is being constructed by JDS Construction Group in partnership with Property Markets Group. The tower is scheduled to be completed by early 2018. 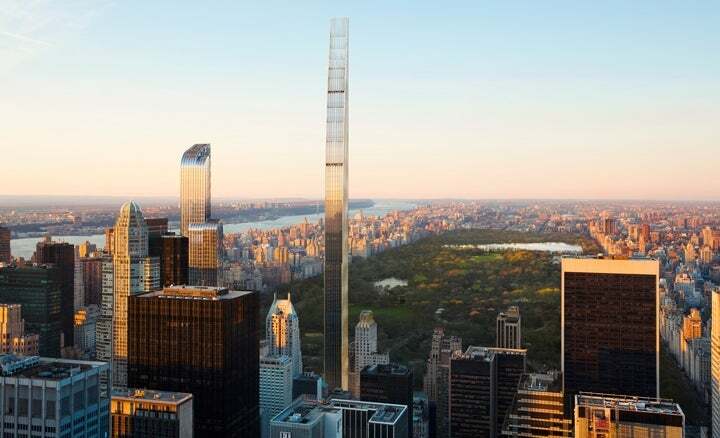 Designed to be the world’s most slender skyscraper, the tower will be located between 6th and 7th Avenues near Central Park and Carnegie Hall on 57th Street in Manhattan, New York. The project involves a Steinway building designed in 1925 and a brand new luxury residential tower by SHoP Architects. The tower is touted to become one of Manhattan’s tallest residential towers and set to be an iconic addition to New York’s skyline. The super-tall tower is being developed at an estimated cost of $1bn. Construction on the tower started in 2013, following the receipt of approvals from the Landmarks Preservation Commission. Inspiration for the towers was drawn from the earlier slender and tapering structures such as the Empire State and Woolworth buildings. The tower will be built on a 60ft-wide base, making it the thinnest tower. With a height of 1,438ft, the tower’s width-to-height ratio is 1:24. The tower base will be constructed in a courtyard surrounded by the existing Steinway building. Views from the tower will reflect the Steinway building’s front façade. The Steinway building’s ornate interior rotunda space, its main showroom and a dedicated recital hall will be preserved as part of the new development. The tower on its northern park facing side will rise straight up, while the south end will gently slope back in a series of steps that will eventually reduce the north-south dimension and give rise to a super sleek structure. At the top, the structure will have no depth and will be a glass wall at the crown of the building. The tower’s stepped-back, ‘wedding cake’ design interprets the architecture of the past in a subtle modern way. The tower’s form multiplies the set-back to present a feathered, rather than a stepped profile. The grand residential tower will have 77 floors of apartments with one residential unit a floor, offering 360° views from every apartment. The tower will feature full floor and duplex apartments with an average unit size of more than 4,000ft². At its base, the heritage will blend with the modern, providing shared recreation spaces, a lobby and high-end retail space. The east and west façade of the building are terra cotta-clad and create a striking movement of shadows and light from the city while adding to the richness of the structure. The northern façade of the tower will be of glass and is designed as a curtain wall that highlights the beautiful panoramic views of the Central Park from the tower. The façade has been designed to read at various scales and vantage points. Bronze latticework will adorn the façade. "The tower is touted to become one of Manhattan’s tallest residential towers and set to be an iconic addition to New York’s skyline." Lighting of the tower highlights the crown and creates a shimmering effect along its length. The lighting has been designed to alter dynamically in accordance with the lunar cycle, thus creating a visual connecting the crown to the ground. The skyscraper’s shear walls that run the full length of the east and west exterior walls have been thickened to as much as 3ft to fortify the structure. The tower’s 15.5ft floor-to-floor height provides ample space to conceal the stiffening beams above the ceiling. The developers have a secured a loan of $725m from AIG and Apollo Global Management for a period of four years to sell the high-end condominiums. WSP | Parsons Brinckerhoff has been selected as the structural engineer for the project. Interior designing for the tower will be provided by Studio Sofield, while Jaros Baum & Bolles will be the mechanical, electrical and plumbing (MEP) consultants. An environmental site assessment was carried out by GRS Group on the project site. L’Observatoire International will provide façade lighting for the new tower and Steinway Hall along with all terraces, performance spaces, amenities areas and millwork in the residential units.